Kuhnsville is the western terminus of the Lehigh Valley Thruway. The original freeway ended here, where current US 22 now has a partial interchange with Tilghman Street. The exit sign on westbound US 22 at this interchange reads "Kuhnsville". The Thruway now continues one half mile west to the interchange where US 22 westbound begins its concurrency with I-78. Kuhnsville is about a mile east of Fogelsville. Tilghman Street is the main surface street of the area, passing from Fogelsville through Chapmans and Kuhnsville on its way to Cetronia and Allentown. Interstate 476, the Northeast Extension of the Pennsylvania Turnpike, forms the informal boundary between this area and the Cetronia and Walbert areas to the east. I-476 has an interchange with US 22 at the eastern edge of Kuhnsville. ^ "Kuhnsville". Geographic Names Information System. United States Geological Survey. 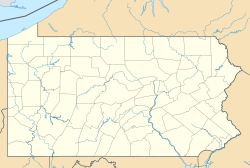 This Lehigh County, Pennsylvania state location article is a stub. You can help Wikipedia by expanding it. This page was last edited on 25 March 2019, at 20:36 (UTC).